Brass Embossed Pin Tray.Brass is the finest gift given by our ancestors. Brass is used for multifarious purposes like ornaments, sculptures and even utensils. Brass is opted as utensils as they are firm and unbreakable. 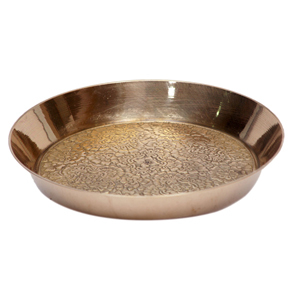 In addition, brass utensils like brass tray do not loose glaze for longer period of time. Brass are fire resistant and heat as well. These Brass tray look very nice and hence are common gifts in the marriage and many other ceremonies.